2 bikers have been killed in an accident on Delhi’s infamous Signature Bridge, while they were clicking a selfie and performing stunts this morning. The bridge was in making from last eight years and was opened on November 4, amid the controversy created at the inauguration by the AAP and the BJP lawmakers. The bridge was being described as an engineering marvel and a selfie clicking point as due to open on the bridge, which could have made a designated place for the people to click selfies, but the incident occurred today, where 2 bikers have been killed and the bikes were found down on the land. The bridge is asymmetrical and that too of 2,214 foot which is built just across the river of Yamuna, and the viewing gallery is 155 foot high. As soon as the bridge was opened to the public on November 4, more than a dozen of cases of improper parking were detected by the Delhi’s Traffic police. 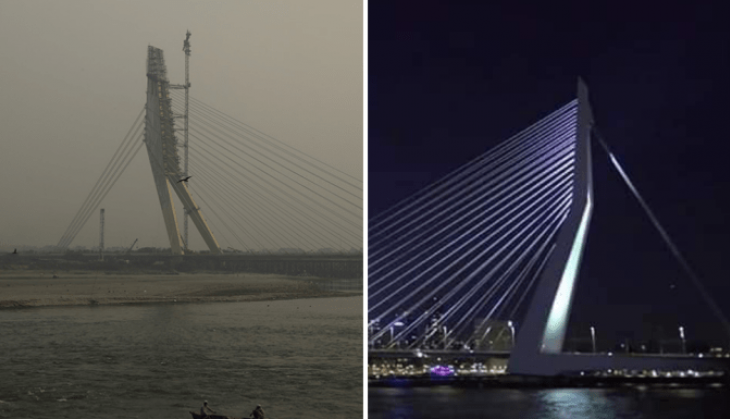 It was also seen that there were around 24 one-way violations on the Signature bridge. Also read: Guru Nanak Jayanti: India and Pakistan to unite for Sikh pilgrims for this big reason! Delhi: Two bike-borne persons died when they fell off their motorcycle after it rammed into a divider at Signature Bridge, earlier this morning.